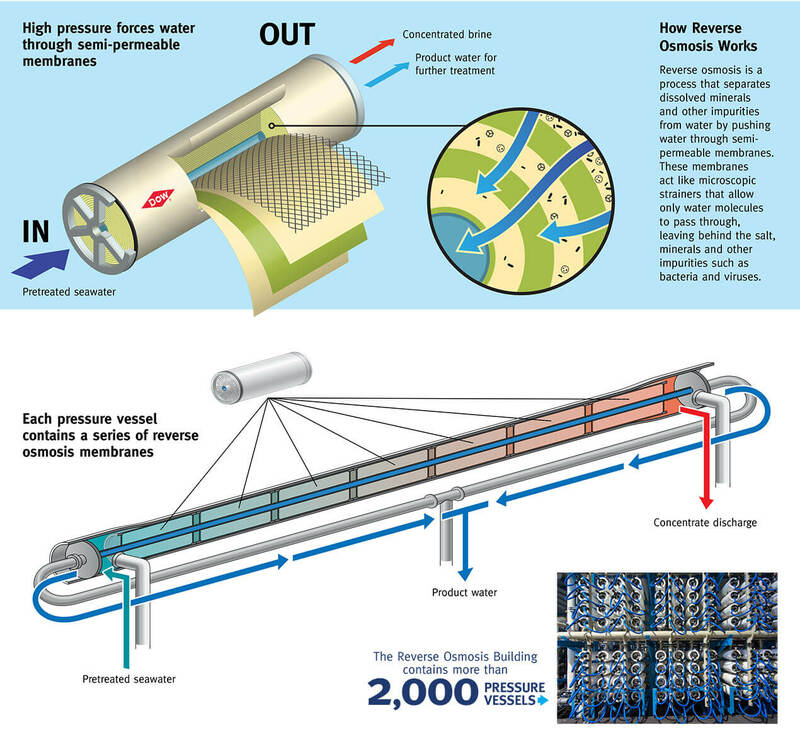 It takes world-class engineers to design and build a desalination plant that produces 50 million gallons a day. The process starts with drawing water from the ocean, and it ends 10 miles away where a giant pipeline connects to the regional water delivery system. 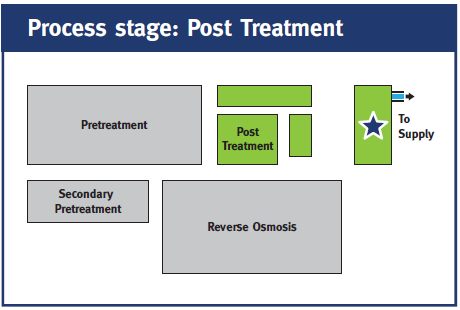 In between, a series of treatment steps and technologies helps to achieve the goal of securing an endless water supply from the sea. The Claude “Bud” Lewis Carlsbad Desalination Plant is capable of delivering more than 50 million gallons of fresh, desalinated drinking water per day – enough to serve approximately 400,000 people in San Diego County. Commercial operations began in late 2015, providing the region with a reliable and locally controlled water source. On a typical day, the Carlsbad plant uses 100 million gallons of seawater from the Pacific Ocean that enters through an intake on the shores of Agua Hedionda Lagoon. 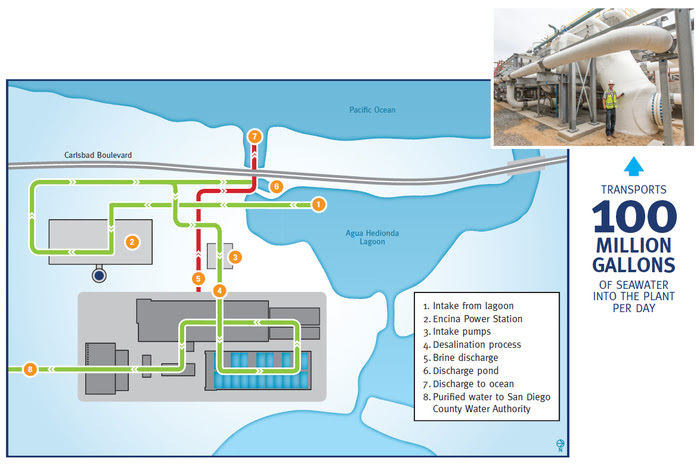 Seawater is drawn into the pump station and transported to the plant via the 72-inch seawater feed pipe to begin the desalination process. Roughly half of the water flowing through the plant is converted into drinking water for the region. The remaining water, carrying all of the original salt and minerals, is returned to the ocean through the lagoon. 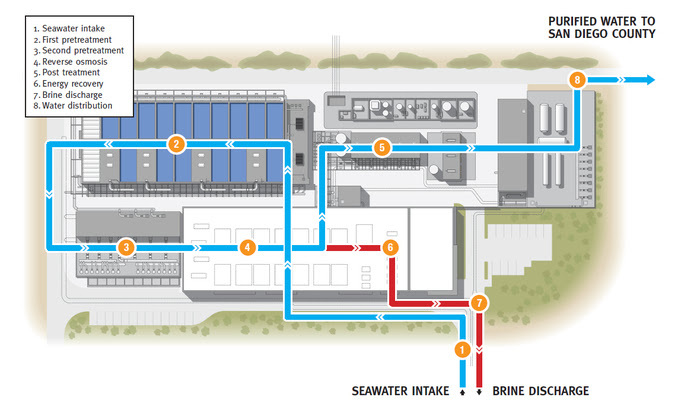 Most people think of desalination only as removing salt, but the process also removes other mineral, biological and organic impurities to produce extremely high-quality water. When seawater arrives at the plant, it goes through a pretreatment process to eliminate algae, organic materials and other particles. 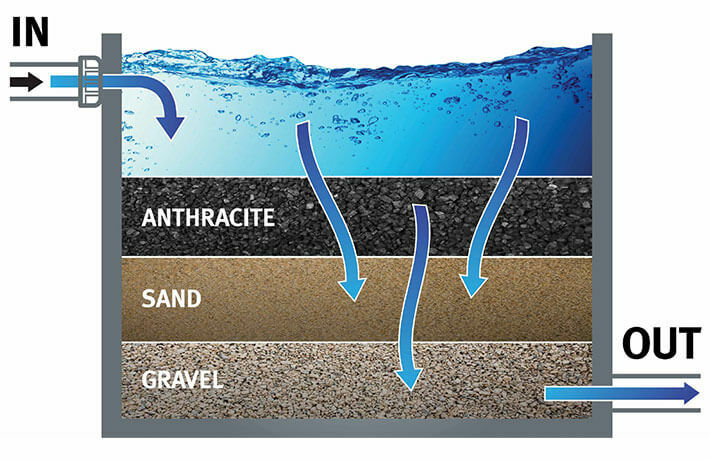 Seawater is pumped into multimedia filter tanks which contain layers of anthracite and sand atop a bed of gravel. 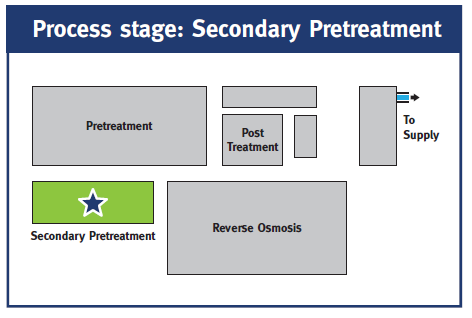 Then, the water moves into the second pretreatment stage to remove smaller impurities. 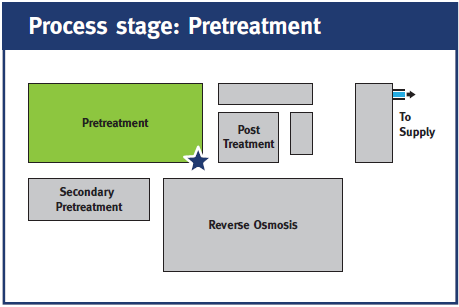 Before seawater enters the reverse osmosis filters to separate the salts, it must go through the second stage of pretreatment called microfiltration to remove smaller – oftentimes microscopic – impurities. 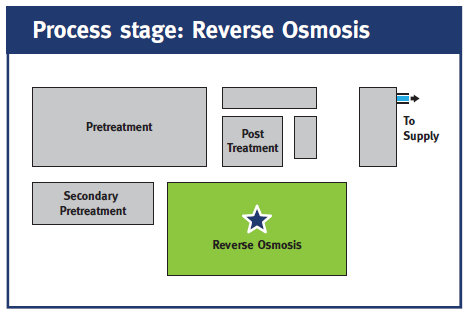 At this point, virtually all impurities other than dissolved salts and minerals have been removed from the water, but it still needs to go through one more step to remove the dissolved salts and minerals to be ready for drinking. 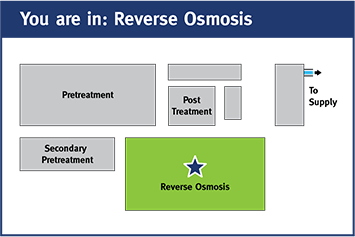 The byproduct of reverse osmosis – called brine – contains roughly twice as much salt as seawater. 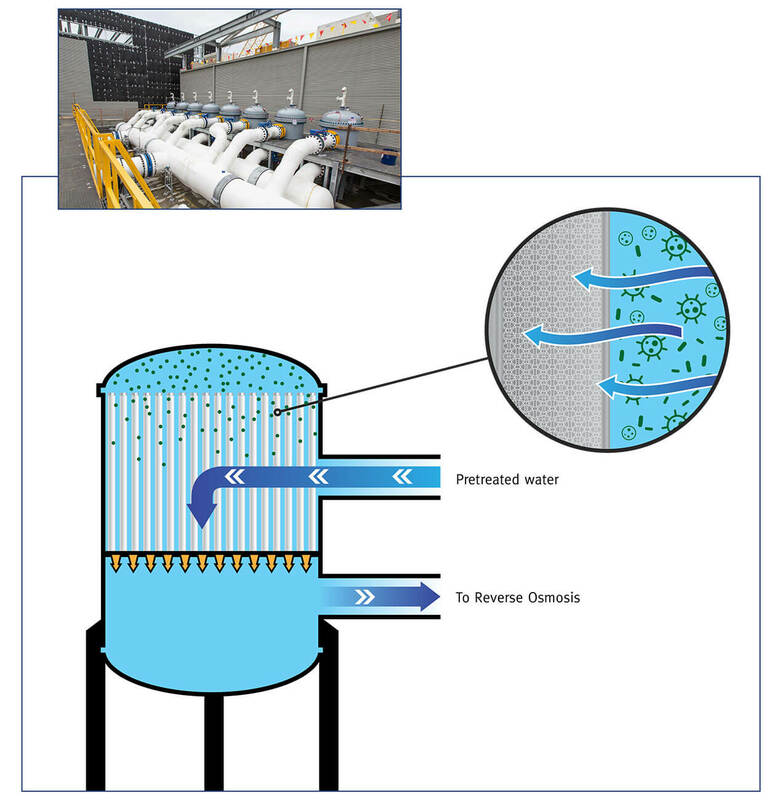 Before it’s discharged to the ocean, brine from the plant is diluted with seawater to reduce its salinity and ensure minimal impacts to the ocean. 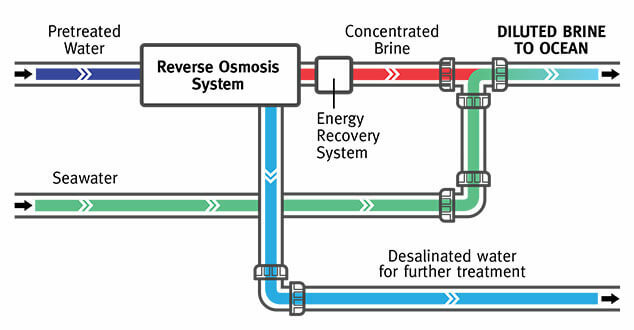 The Carlsbad plant uses energy recovery devices that recycle the pressure from the reverse osmosis process. These devices save an estimated 146 million kilowatt-hours of energy per year, reducing carbon emissions by 42,000 metric tons annually – roughly equivalent to the annual greenhouse gas emissions from 9,000 passenger vehicles. 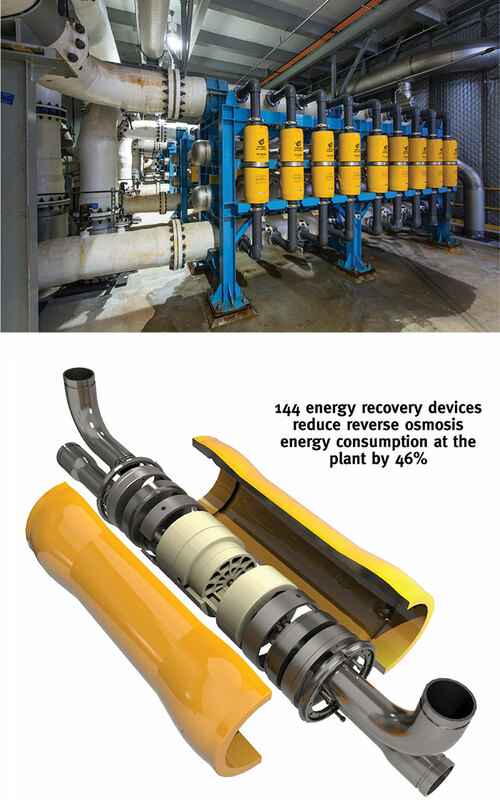 There are 144 energy recovery devices at work in the plant, reducing the overall energy consumption of the reverse osmosis process by 46 percent. The energy recovery devices capture the hydraulic energy created by the high pressure reject stream of seawater produced during the reverse osmosis processes and transfer it into incoming seawater, without consuming any electrical power themselves. After reverse osmosis filtration, the fresh water is nearly ready for consumption. But before making its way into your faucet, the water must undergo “post treatment.” This includes adding some minerals back into the water and disinfection with chlorine. Now the water begins its journey from the plant to taps all across San Diego County. 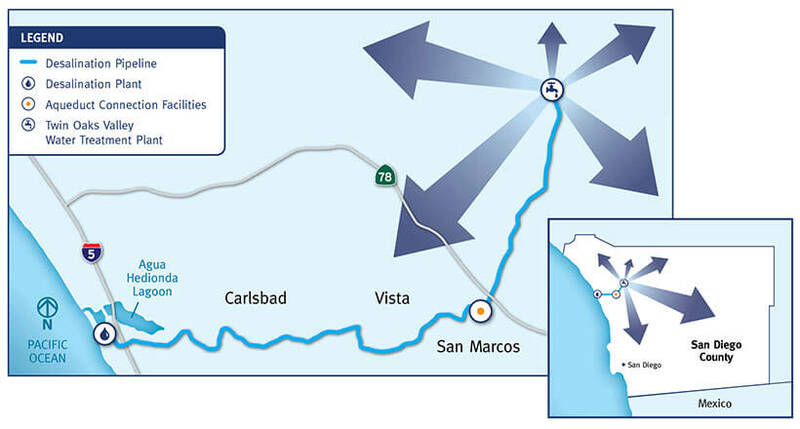 That process starts by pumping water through a 10-mile, 54-inch pipeline to the east through Carlsbad, Vista and San Marcos to the San Diego County Water Authority’s Second Aqueduct. Then, the water moves north to the Water Authority’s Twin Oaks Valley Water Treatment Plant, where it’s blended with imported water supplies and routed into large-diameter pipes for delivery throughout the region.